Serendipity means a pleasant surprise or the luck of finding something you weren’t looking for. Serendipity by Kei Boutique means finding that one piece of clothing you weren’t even looking for, but is just the perfect thing to make your wardrobe. When Serendipity by Kei contacted Durden Outdoor to make them famous, we were beyond ecstatic to help promote their eclectic selection. 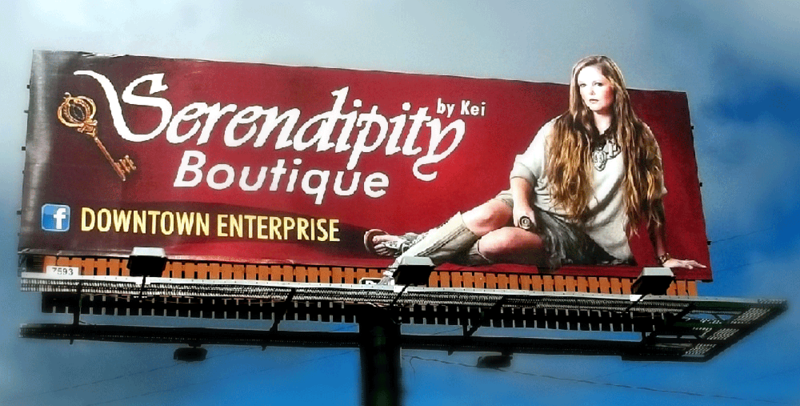 We started with a conversation with Serendipity by Kei’s owner, Keisha, about her vision for her boutique, as well as their advertising goals. This was a very enlightening and inspiring step, as her energy was highly contagious and got our creative team motivated to design the best board we could. We then started brainstorming and sketching concept art, which we would send over to Keisha to discuss and review; this honed in and refined the message, as well as the design. After the concept was approved, we were able to set up a wonderful photo shoot with our photographer partner Mark Broadway, and Serendipity’s delightful model, Mary Holland. A fashion shoot like this one was great to be a part of, as we were open to have fun and show off all the great items Serendipity by Kei has to offer. Keisha’s passion for her store, her customers, her fashion, and her vision were major inspirations for our design. She worked with us every step of the way, sharing her wisdom about her store and her excitement about our concepts, designs, and final product. Keisha put her feelings about the final design best in our last conversation, with an excited “Whoopie!” To find out more about Serendipity by Kei, check out their Facebook Page. If you would like to be made FAMOUS, contact our sales department at sales@durdenoutdoor.com or call 334-792-5056 to speak with one of our creative image consultants.